Summer is the most colorful season of the year. Bright colors and flowers are all around you. So what’s the point of ordering flowers if you can find them anywhere? Surprisingly enough according to several polls people like to receive flowers as gifts all year round! The flowers you can find in your backyard are fine enough, but an arrangement delivered to your doorstep by a courier is something truly special. Cyber Florist delivers flowers every day, 24/7. We can make deliveries to different cities and countries, to small towns and villages, to remote settlements on Norwegian fjords and large cities. Check out the photos of our deliveries to see for yourself. Apart from our vast catalog of flower arrangements we deliver a wide range of different gifts such as fruit and food baskets, fruit arrangements, giant teddy bears and much more. So what do you choose? Our best advice is for you to pick something based on the recipient’s taste. If you are unsure, follow this simple rule: large bouquets of red roses are very romantic; however it’s not a suitable gift for your mother on International Women’s Day. Although if you would like to impress your grandmother, 101 rose is something she will surely talk about with her neighbors for a long time! Huge teddy bears are really romantic and sweet and are a beautiful gift for girls of 3 or older, but getting something like that for your mother or grandmother might not be the best idea. However sweet those enormous bears are they are incredibly impractical! We mentioned several items that aren’t suitable as presents for your mother or grandmother, so how about something they might enjoy for a change? Flower baskets are both beautiful and resilient (and mothers and grandmothers tend to be very self-organized to look after them). Arrangements with lilies are beautiful but please make sure that the recipient likes them before you place your order online. These flowers have a strong smell and not everyone enjoys it. Fruit arrangements are universal as gifts – they are suitable for men and women of all ages. A beautiful and unique gift also happens to be quite tasty! A basket of food or fruit would be an ideal choice for a family celebration. Something like this always comes in handy when you need to serve a huge meal for all your relatives. 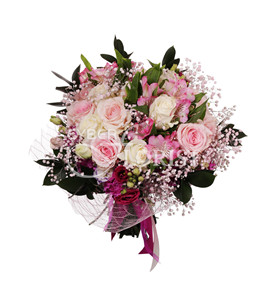 How can I order flowers for delivery? If you cannot find something to your liking or would like to order something unique, send us a custom order inquiry! Write down everything you would like to have delivered and our customer service team will do their best to make it happen. Send flowers and gifts – send emotions and good mood with Cyber Florist!